Did you ever know that Facebook has this unique feature of memorializing accounts ? I frankly, didn’t know about this until I digged into Facebook’s FAQ thanks to Apoorv. Memorializing is a way to mark a dead person’s (deceased) profile as dead. This process sounds very similar to marking a profile as spam, but literally it isn’t like that. Memorializing is more of report-with-proof kind of thing rather than just clicking on a button and reporting an account dead/deceased. And to be fair enough, that’s the way it actually should be in order to prevent misuse of this feature. Such a feature is actually a boon to both the deceased family as well as Facebook’s servers. The deceased’s family would obviously want some privacy and memorializing does exactly that. It set’s the deceased user’s profile as private so as to ensure that only close confirmed friends and family of the user are able to view it and post messages in remembrance of their lost one’s. 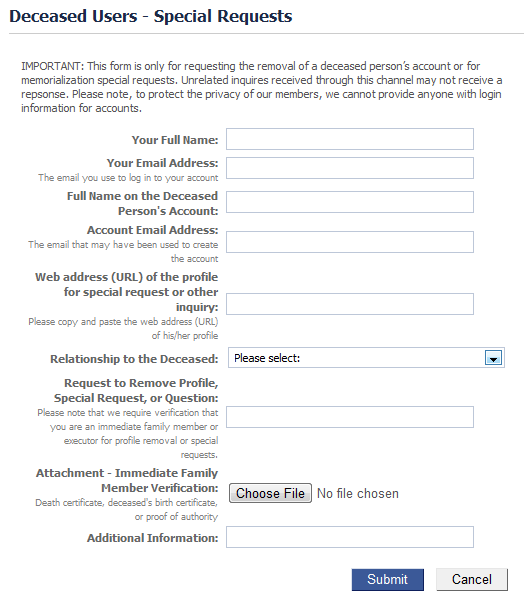 For Memorializing a deceased user’s profile you just need to fill out this form correctly and submit it. Make sure that you provide some valid documents/images in the Proof of Death field. Don’t submit the form with false information in it as legal action is viable in this case. Facebook also provides an option to remove a deceased user’s profile completely along with all the related content, information, etc. But for that, the immediate family member has to fill another form which expectantly demands more documents (for verification). Proof that you are an immediate family member or legal representative. Remember that both memorializing and removing a user profile will prevent it from appearing in Suggested Users section, Search results and other activity sections of Facebook. I know memorializing was introduced in 2009 itself, but I’m publishing this post now because I wasn’t aware of this feature till now & many are still in the same boat as I’m. Our Facebook page hasn’t been memorialized, so you are free to like it. Don’t you think other Social networks should also adopt this policy of memorializing/removing a deceased user’s profile ? That is nice that they have the option to do that and hold onto the memories of the page. Thanks for the informative article. I didn’t know anything about this till now and I also didn’t know that Facebook can upload your photo that you post and use it as advertisement also. I highly recommend people that is signing up for Facebook should read the FAQ. Very informative and helpful post. I really don’t know about this before. I will share this post with my friends also. Thanks for sharing your thoughts. Thanks for sharing this Facebook Memorialize feature. I actually did not know anything about it until now that I’ve read your post. 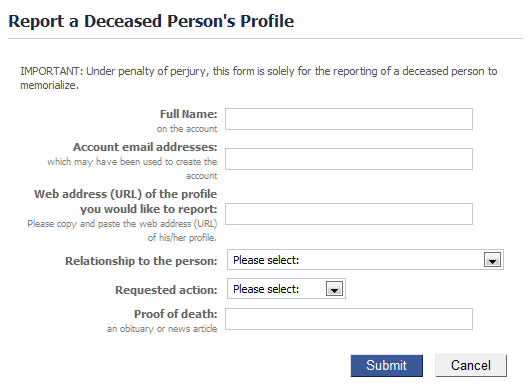 It sure is quite a load of work to report that someone in your Facebook friends is already dead, but I think it is up to the family of the one who died that should do this action since they have proof of their deceased loved one’s death. I am trying to memorialize my sons FB account. I want to be able to put a picture on his profile as shortly after his passing for some reason the photo disappeared. I would also like to be able to manage his acount and add additional friends and family as he passed away shortly after creating his page. I have been trying to memorialize my dad’s page but have been unsuccessful. I have no idea what a URL is or where to locate it. My dad has been gone for over a year and I think somebody has hacked into his account because we are all of a sudden getting posts from him. Does a Local Business Really Need Its Own Website?